U.S. 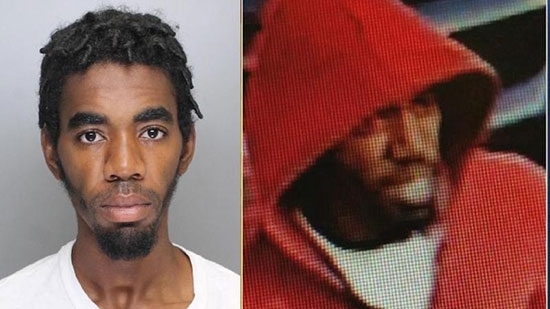 Marshals have arrested a man in Georgia wanted for shooting and killing a man outside an apartment in Haverford Township last month. 24-year-old Derrick Rollins was taken into custody in Decatur, GA, near Atlanta. He was found hiding at an apartment complex with a female associate. He is being held at DeKalb County Jail awaiting extradiction. Rollins is wanted in connection to two incidents on July 29th. The first happened around 5 p.m. on the 1600 block of North 77th Street in Overbrook where police say he fired 17 shots at people. No one was injured. The second happened around 6 p.m. on the 2300 block of Haverford Road in Haverford Township on the border of the Ardmore and Havertown neighborhoods. 29-year-old John Le was shot and killed in the doorway to a friend's apartment after picking up an order of food at the pizza place down the block. Rollins was captured on surveillance footage running away. Marshals were able to track his whereabouts to Georgia. The National Transportation Safety Board (NTSB) is investigating after a train crash at 69th Street Terminal in Upper Darby sent 42 people to the hospital early Tuesday morning. It happened at 12:15 a.m. when a Rt 100 Norristown High-Speed Line train was arriving at the station and crashed into an empty train parked on the tracks. Four people, including the train operator, had serious but non life-threatening injures. Several passengers reported the train had passed their stations and backed up to pick them up. They also noticed the train seemed to be traveling especially fast. This is the second train accident at the station this year. A Market-Frankford El train derailed in February injuring 4 people. Montgomery County Judge Steven O'Neill has granted a defense request to postpone the sexual assault retrial of Bill Cosby. The retrial was scheduled to start on November 6th, but will now start sometime between March 15th - April 1st, 2018. Today was the first day that Cosby was represented by his new law team in court after his original lawyers, Brian McMonagle and Angela Agrusa, withdrew from the case. He is now respresented by attorney Tom Mesereau who was also on the Michael Jackson child molestation case as well as other celebrity clients including Mike Tyson, Robert Blake and Suge Knight. The new lawyers wanted more time to get acquainted with the case. The annual Army-Navy football game will remain a primarily Philadelphia tradition for the next few years. It was announced today that the Cadets and Midshipmen will face off at Lincoln Financial Field in 4 of the next 5 years. That includes 2018, 2019, 2020 and 2022. The games is already scheduled to be played here this year in 2017. It will be played at MetLife Stadium in North Jersey in 2021. Philadelphia has hosted 86 of the 117 games. The location was originally chosen as a mid point between the two academies in West Point and Annapolis.